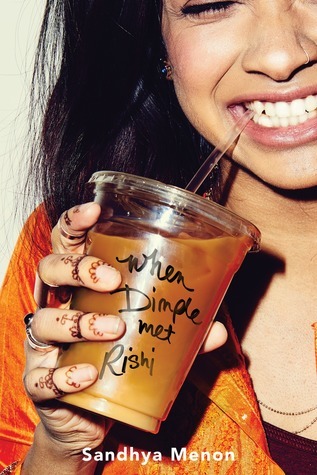 When Dimple Met Rishi isn't a perfect debut, but it has so much going for it with its South Asian leads that I want to focus on the good, more than the bad. First off, my biggest misgiving going into this is that the premise is based on our eighteen-year-old protagonists being set up for an arranged marriage by their parents. So, let me clarify exactly what the synopsis of this story fails to explain in greater detail: Dimple has just been accepted to Stanford and desperately wants to spend her summer at a prestigious program in SFSU designing her own app. She's surprised when her parents agree as easily as they do to drop the money and foot her summer dreams, especially since her mother wants her to find a good husband (Ideal Indian Husband, actually) in college. When she gets to SFSU, however, she realizes that her parents old friends son, Rishi, is also there and unlike her, he's actually been told that their parents are considering getting them married and see this summer as a chance for the two to see if they're compatible or not. It's a little out there, IMO, but it's handled well since Dimple is career-driven and quickly dispels any notions of marriage the moment she meets Rishi. From that unlikely start, the novel proceeds much like any contemporary romance--only so much better, really. Rishi has grown up in a wealthy household, appreciating his roots and staying true to them at every turn. Dimple, meanwhile, grew up middle class with a stay-at-home mom who had far too much time to focus solely on her daughter's appearance. Dimple feels stifled by the culture her parents push on her but through her interactions with Rishi, she grows to understand their perspective more--just as Rishi understands Dimple and her experience. Their conversations are a wonderful window into the South Asian American experience and while I didn't identify with just Rishi or just Dimple, I identified with many of the topics they covered and feelings they shared. I especially love that Menon doesn't hesitate to include Hindi, Bollywood film references, and traditional Indian food in a very organic way throughout the novel. It doesn't feel forced and absolutely adds to the story. Further, Dimple and Rishi's parents are a huge part of their life and I love that they continue to play a big role in the novel, especially as we get both Dimple and Rishi's perspectives in this, so we get to see both sides of that parental relationship. Other positive aspects to this one? A diverse cast, ses-positive YA, and a really lovely exploration of Indian culture and the ways it can be confusing but also empowering to young South Asian teens. Where this story falters for me, however, is in the execution of its romance. I enjoyed the love story, but I didn't fall head-over-heels for it and I found the inevitable break-up and resolution to be rather contrived and unnecessary. I loved the inner-conflicts that both Dimple and Rishi face individually during the course of their relationship, but the actual romance and backdrop at SFSU and secondary character drama didn't do much for me, personally. That being said, I'm still thrilled to see a novel that breaks barriers with South Asian leads. For me, this is HUGE. Being able to see parts of your relationship with your parents or your immigrant experience in a book is not something I'm familiar with, so for that alone I think Menon succeeded. I hope she continues to write about South Asian Americans because I'm definitely on board for her next book, and her next book, and her next. This sounds like an interesting book. I am sorry the romance wasn't that swoon worthy in this book. I do like that the author did a great job holding onto the culture. Great review! I'm really excited to read this one. I don't think I've read a book before that features South Asian characters before so that's an added bonus. Sorry to hear that the romance didn't do it for you, though. I'm going to lower my expectation with that element of the book. I'm glad you liked this one! I'm sorry the romance didn't quite work, but it is great that the book focuses so well on South Asian characters and culture. I had my eye on this book for a while. It has such catching sunny-mood cover that just calls to me. Thanks for your comments about arranged marriage; the blurb is somewhat misleading about that. I’m glad to hear you’ve found representation of Indian culture authentic and weaved into the book in an organic way. I’m not very familiar with Indian culture, so it’s hard for me to gauge these things. And parents who are a huge part of their kids’ life make me smile. I see more and more YA books with positive family representation, and I like this new trend. It seems like up until recently every YA title had absent, ignorant or abusive parents in them. The romance however doesn’t sound very appealing. Romance is very important aspect for me, so it’s disappointing that you’ve found Dimple and Rishi’s relationship lacking. Wonderful review as always, Keertana! I've heard this is super adorable, and I'm happy to hear that you found bits authentic and relatable. Don't like to hear of unnecessary drama, though, but I can easily speed read through that sort of thing. Wonderful review, Keertana! I'm reading this right now - half way through - and can relate to Dimple so much as a South Asian immigrant. I love that we're slowly starting to get more diverse leads in YA and hope this continues! I love your review for this and that there were so many positives to do with the not so good as well. Wonderfully done! I've had my eye on this book for a while - feels like I'm counting down the days until it comes out!